Mauricio Pochettino’s side came away from Stamford Bridge with three points — a first for the club since 1990. 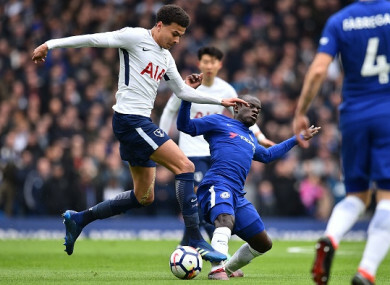 N'Golo Kante tackles Tottenham goalscorer Dele Alli. CHRISTIAN ERIKSEN’S STUNNING strike and a Dele Alli double delivered Tottenham their first win at Stamford Bridge since 1990 as they dealt Chelsea’s Champions League hopes a hammer blow with a 3-1 Premier League victory. Spurs went into the contest five points clear of their hosts in the race for Champions League qualification and looking to end a hoodoo that stretched back to the pre-Premier League era. It looked unlikely that they would do so when Alvaro Morata pounced on a goalkeeping error from Tottenham captain Hugo Lloris to head Chelsea ahead with his first Premier League goal of 2018. But a wonderful long-range leveller from Eriksen on the stroke of half-time proved the turning point in a contest that left Antonio Conte under yet more pressure. Tottenham dictated matters in the second half and two goals in the space of five minutes from Alli ensured the end of their long wait for a win in west London. Alli brilliantly took his first in the 62nd minute to make it 2-1 and then profited from some poor Chelsea defending to effectively wrap things up, Tottenham’s day capped off by the return of Harry Kane from an ankle injury as they moved eight points clear of the Blues with seven games to play. After a subdued start Chelsea sprung into life when Willian fired a fierce low effort that took a deflection only to be beaten away by Lloris following a well-worked counter from the hosts. Marcos Alonso then confidently converted from N’Golo Kante’s clever lofted ball into the box but was correctly flagged for offside. Mauricio Pochettino’s side – unbeaten in the league since December – failed to heed those warnings, though, and after Victor Moses forced Lloris into action once more, the same player created the opening goal with a helping hand from the Spurs keeper. Lloris left his line to claim a Moses cross from the right but failed to do so, allowing Morata to rise and nod into the unguarded net. An ambitious long-range effort from Eriksen dealt with by an off-balance Willy Caballero looked like being Spurs’ sole response of the half, but instead it served as the pre-cursor for the stunning leveller that followed. Lloris somewhat redeemed himself by keeping out an arrowing low strike from Alonso and Eriksen then restored parity in remarkable fashion. The Denmark international again let fly from long distance but this time produced a high and swerving shot that dipped under the crossbar beyond a helpless Caballero. Tottenham had rarely been in the ascendancy prior to the equaliser but it was the visitors who controlled matters after the restart, and Son Heung-min’s curling effort drew a fine diving save from Caballero, who could do little as Alli completed the turnaround. Alli controlled Eric Dier’s marvellous ball over the top with a sublime first touch and produced a finish to match as he lifted the ball over Caballero and in off the post. Four minutes later Alli doubled his tally and Tottenham’s advantage with his first Premier League brace since January 2017. Eriksen was to the fore as his first-time pass played in Son down the right and, though the South Korea international was twice denied by Caballero, a comedy of errors in the Chelsea defence presented Alli with the chance to slot in from point-blank range. Chelsea huffed and puffed with little reward as they sought a response before Kane somewhat surprisingly entered the fray despite the away side’s measure of command. Tottenham’s talisman had no opportunity to mark his comeback with his goal while Lloris enjoyed a similarly quiet end to the game as Spurs finally made some happy memories at Stamford Bridge. Email “Alli double and a super strike from Eriksen sees Spurs earn historic win over Chelsea ”. Feedback on “Alli double and a super strike from Eriksen sees Spurs earn historic win over Chelsea ”.